iPhone X pre-order deals have now launched in the US and the UK, so if you've been waiting to get one of the 10th Anniversary iPhones now is your chance! You will need to be super quick though - stock is said to be extremely low, with many retailers and resellers only being allocated very small numbers of units. So if you want to pre-order the iPhone X in time to get one before Christmas you'll need to act fast. Luckily we have your back though - we have price comparison tools for you to filter and compare all of the available iPhone X pre-order deals, and we're also naming what we think are the best value options. To see our top recommendations, see the following links or the deals in the table. So, what does it take to successfully find the iPhone X in stock? Knowing the date, time and hitting the refresh button on the right app. We'll explain. Need more iPhone X pre-order advice? Follow and tweet us and we'll direct you to the right deal with some secret tips. We'll be live tweeting the pre-order. This is our favorite tip because every year it separates the new iPhone owners from the ones still angrily clutching their old phone. Every year. Downloading the Apple Store app (different from the web App Store) will be the best way to score the iPhone X. We'll be using an iPad Pro running iOS 11. Why is this important? While the Apple Store website and app go down the night before pre-orders begin, the app always comes back online first. Okay, now that our favorite iPhone X tip is out of the way, let's get to the equally important basics: the date and time of the pre-orders. The official pre-order date is Friday, October 27 – but wait. You should think of it as starting the night of Thursday, October 26, especially in the US. In the US, pre-orders begin at 12am midnight Pacific time in Apple's home state of California. But that means you'll have to be up at 3am on the East Coast. iPhone X UK pre-orders begin at the much more reasonable time of 8am. If you do the conversion, this is the same moment everywhere in the world. Practice. Practice. Practice. If you don't have your information pre-loaded onto the Apple Store, you're not getting an iPhone X. Plain and simple. The easiest way to make sure all of your credentials, including your address and credit card information, are up to date is to almost buy an iPhone 8. Set up Apple Pay, know your Verizon account password, and so on. You'll know if you're eligible for an upgrade, and be able to glide through the menus in advance of the pre-order. Just do this before the Apple Store goes down tonight. We've spoken to so many people who've said, "I'm going to hold off on buying the iPhone X for now," acting like they'll get it in time for Christmas. Nope. Just nope. If you don't pre-order Apple's new phone on day one and at minute one, there's a very good chance you won't be able to buy it until 2018. The iPhone X will be out of stock, according to analysts who estimate that there are about two to three million units to go around at launch. Apple usually has 10 million units of a new phone on hand, and sells out of those – now imagine a third of the usual inventory. Your best shot at an iPhone X, and at getting it as early as possible, is to pre-order the phone and reserve an in-store time to pick one up in person. Here's a surprise: Apple will also be selling the iPhone X to walk-in customers. It says, in an understandable way, that you are "encouraged to arrive early." Early as in, like, now. You can wait at the Apple Store, or try your luck at a store like Verizon. They get in far fewer shipments, but the line-waiting competition is a lot thinner. There's a eureka moment between the Apple Store being down and coming back online. It usually doesn't happen at the exact pre-order time. Don't freak out. Instead, keep refreshing either your browser, or our suggested device, the iPad Pro running the Apple Store app. We'll actually be using both. The proper way to refresh on the iPad is to close the app (double-click the home button), flick the app window upward to close, and open the app back up again. Know in advance the exact configuration of your ideal iPhone X. It'll save you an extra few seconds, which could make or break your chances of getting it on the first day. Which carrier are you ordering the iPhone X from? Are you getting AppleCare+ or chancing it? Your credit card company doesn't take kindly to sudden $999 purchases at 3am if you're ordering from New York. We were initially blocked from ordering an iPhone 8 Plus for this reason. Forewarn your credit card company of a big impending purchase, or at least have your email open in case they block it. You can usually sign off, saying the purchase was valid, and order again. You don't have to do this step, but it's better to be safe than sorry (and without an iPhone X on day one). The Apple Upgrade Program seems more expensive, but it isn't really because it comes with AppleCare+ included in the price. And, you get a new iPhone every year. While the upgrade program ran into issues in 2016, with upgraders not being able to get the phone they wanted on day one, Apple has remedied that in 2017. While you're not getting preferential treatment with this program, if there's anyone with a leg up in the iPhone X pre-order competition, it's these people. Okay, your chances of getting an iPhone X are slim, but you can still own a brand new, perfectly good iPhone in 2017. The iPhone 8 and iPhone 8 Plus are available to buy right now, and there are deals on both phones coming in the US and UK through various carriers and retail sites. 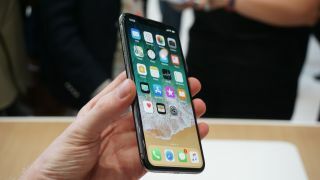 These handsets aren't the revolutionary upgrade the iPhone X is, but they're good phones that will keep you satisfied… until the iPhone X2 launches next year.